I was inspired by that iconic Hubble image of the Pillars of Creation where new stars are being born from the primordial gas and dust in the nebula. 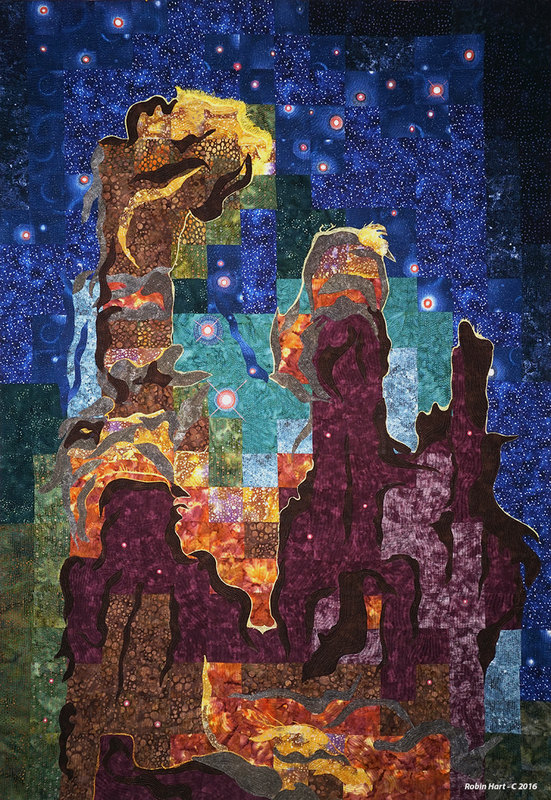 This art quilt took more than 2 ½ months to complete. I used the grid method for the background, made up of individual squares, which were pieced together, and signifies the pixelated data in which deep space images are transmitted. I then cut out applique pieces and fused them to the art quilt, to soften and create undulating lines and movement. I then heavily machine, free motion quilted the entire piece in multicolor threads, (Called thread painting) in different stitch lengths to create texture and more movement. I wanted to express the dynamic energy of birth through color and form. Materials for the art quilt are cotton batiks and prints, batting, and many yards of multi-colored threads.